Mobile web adoption is growing 8 times faster than web adoption did in the 1990s and early 2000s (Nielsen). All these stats are triggers for online retailers to take mobile very seriously and improve the online shopping experience for consumers using smartphones and tablets. Every 100ms increase in load time decreases sales by 1% (Amazon). reduce the number of plugins and redirections on website, etc. This is an extension of the above behavior. Consumers today do not like keying in a lot of information or a complicated checkout process. Convert more by allowing your users to checkout without logging in or make it easy for them to log in by using their existing social media accounts. 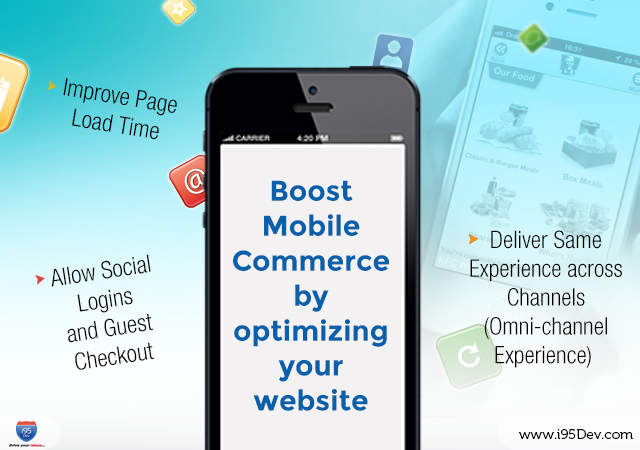 Customers who have already purchased from you through your ecommerce store expect the same look and feel when they shop on their mobile device; that is the experience that they have come to expect from your brand. It is critical for businesses to build on that experience as it improves brand association and brand loyalty. For more information on Omni-channel retail read our blog on how retail has changed to omni-channel retailing and our e-book Pave the Way to Success with Omni-channel Retailing.